Test your knowledge of the last Time Lord and the worlds he's visited in Who-ology, an unforgettable journey through over 50 years of Doctor Who. 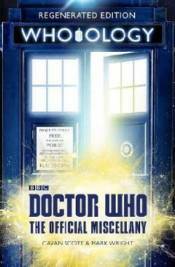 Packed with facts, figures and stories from the show's galactic run, this unique tour of space and time takes you from Totters Lane to Heaven itself, taking in guides to UNIT call signs, details of the inner workings of sonic screwdrivers, and a reliability chart covering every element of the TARDIS. Now fully updated to cover everything through to the 12th Doctor's final episode, and with tables, charts and illustrations dotted throughout, as well as fascinating lists and exhaustive detail, you won't believe the wonders that await.